The Academy is selling its Mapex battery percussion as a complete set of 10 snares, five tenors, and five basses. Check out this video from this past summer of the Battalion drum line warming up in the lot in Kuna, Idaho. A deleted scene from the “Clash of the Corps” television show features an inside look at Blue Devils members studying video of their performance in order to fix any mistakes. Corps members always appreciate family members coming out to see them perform. Here’s a tender story of a Blue Knights member’s grandma seeing her granddaughter perform for the first time. Blue Stars announced the addition of Scott Palmer to the corps’ brass staff. Palmer is an alum of the Madison Scouts and Minnesota Brass. Until November 20, when you make $25 donation to the Bluecoats Scholarship Fund, you’ll receive a special Bluecoats Christmas T-shirt in time for the holidays. “Coffee With the Cadets” will bring parents, volunteers, donors, and fans together on November 20 for an informational gathering in Pennington, New Jersey. Anyone who won’t be in Indianapolis this Saturday for Carolina Crown’s percussion ensemble performance at the Percussive Arts Society International Convention can catch the action online. The Cavaliers announced the members of its 2017 percussion instructional team. “With this group of educators in front of our performers, I feel I can write anything and it will come to life!” caption supervisor and arranger Michael McIntosh said. Colt Cadets announced the members of its 2017 design staff. "With this being the corps' 50th anniversary, I'm looking forward to working with this design team to create an educational and entertaining program," assistant director Andrew Eaton said. There are multiple ways you can contribute to the Crossmen this holiday season through online giving. Check out these photos from Impulse’s informational open house last weekend in California. The corps will host its next educational workshop for prospective members on December 11. Coming off the corps’ most successful season to date, Legends is excited to announce the members of its 2017 design staff. The award-winning documentary about the Madison Scouts, “Scouts Honor: Inside a Marching Brotherhood,” is now available on iTunes. Oregon Crusaders announced the members of its 2017 design staff. “Everything about this season will be a notch up in excitement,” executive director Mike Quillen said. 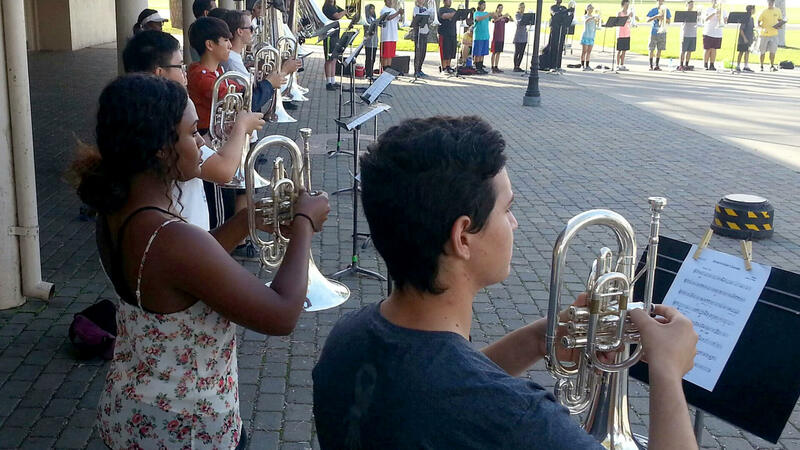 Rockford, Illinois' local newspaper tells the inspirational story of a member of Phantom Regiment who is going to New York City to march in the Macy’s Great American Marching Band, after teaching himself to play the euphonium in the seventh grade. Santa Clara will host its 50th Anniversary Gala on June 24, 2017. The event is being produced in collaboration with the Blue Devils organization, which will be celebrating its 60th anniversary at the same time. Seattle Cascades share the fascinating story of a corps instructor who is currently a Peace Corps trainee in Morocco. No matter where you live, you can support Southwind this Thanksgiving weekend during their online and in-store Barnes & Noble Bookfair. Spirit of Atlanta is seeking nominations for the corps’ Hall of Fame, Class of 2017. This past year, corps founder Freddy Martin and his wife Lynda were inducted as the first two members. Do you know what honor Wyoming can claim when it comes to voting? And do you know what honor Troopers can claim as well? Vanguard Cadets are hosting an educational workshop for brass and battery percussion in Los Angeles to help local returning and prospective members prepare for their upcoming auditions.